KUALA LUMPUR: Mah Sing Group Bhd yesterday introduced a loyalty rewards programme called "M Club" designed to keep its custo-mers returning to the developer and buy more properties in Johor Baru, Penang and Klang Valley. The enhanced loyalty programme offers its 10,000 members the chance to enjoy privileges and discounts of up to 30 lifestyle brands. "We hope in the future our customers will view their M Club as indispensable as their identification card. In fact, in the pipeline is a new-generation Mah Sing Community website complemented by Facebook and Twitter accounts and a community-centric blog," Mah Sing chairman and independent non-executive director Tan Sri Yaacob Mat Zain said in his speech. 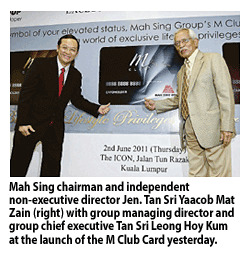 He added that M Club members or better known as the Mah Sing community, will appreciate select bene-fits being brought direct to their doorsteps with the simple act of flashing either their classic, gold or platinum M Club card at the merchants, with services ranging from home and living, beauty and health to wellness and personal development. Among the 30 lifestyle merchant partners are KL Lifestyle Art Space, IHeal Medical Centre, Lightcraft and Times Bookstores.